Updates on Artemi Panarin plus the latest on the Red Wings, Golden Knights, Stars, and Kings in today’s NHL rumor mill. THE SCORE: When questioned by reporters Friday, Panarin remain non-committal about re-signing with the Blue Jackets. “It’s one life, one chance for free agency and I want to test free agency,” he said. 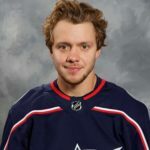 When asked by The Columbus Dispatch’s Brian Hedger if there was still a chance he could re-sign, Panarin paused, laughed awkwardly, said they still had a chance “but … we’ll see what happens in the summer.” He also acknowledged he’s prepared to be traded but hasn’t picked a destination. SPECTOR’S NOTE: I believe this is Panarin’s last season with the Blue Jackets. How long he remains with them depends upon what type of offers they get before the Feb. 25 trade deadline. I’ve maintained the Blue Jackets wouldn’t trade Panarin (or Bobrovsky) as long as they were in the thick of the playoff race. In recent days, however, I’ve changed my mind. It’ll take a sizable return to tempt Kekalainen into trading Panarin and teams could be reluctant to make a big investment in a playoff rental player. Nevertheless, If the Jackets get a suitable offer before the Feb. 25 trade deadline that helps them now and in the future, I think they’ll do it, even if it risks jeopardizing their postseason hopes. At the risk of sounding like a conspiracy theorist, hiring the same guy who represents Bobrovsky suggests both players could attempt to land with the same team via free agency in July. If they both get shipped to the same team before the deadline, one they’d be willing to sign with, Theofanus can broker their new contracts. COULD RED WINGS RE-SIGN THEIR TOP UFAS? MLIVE.COM: Ansar Khan reports Detroit Red Wings GM Ken Holland intends to step up discussions with several of his pending UFA players in an effort to re-sign them before the trade deadline. Of their seven UFAs, the Wings would like to re-sign goaltender Jimmy Howard, winger Gustav Nyquist, and defenseman Nick Jensen. Khan speculates a two-year deal for Howard at around his current annual average value ($5.3 million) seems possible. Nyquist is set to surpass his career-high of 54 points this season while the Wings value Jensen’s skating and penalty killing. TSN: Frank Seravalli reports the Toronto Maple Leafs are believed to have kicked tires on Detroit Red Wings center Luke Glendening, who played for Leafs coach Mike Babcock when the latter was the Wings’ bench boss. Glendening is signed through 2020-21 with an annual cap hit of $1.8 million, which is likely more than the Leafs will be able to afford after this season. If the Wings can be enticed into picking up half of his cap hit, that would make him more affordable for the Leafs. SPECTOR’S NOTE: Holland also suggested it’s possible he might not trade anyone, mostly because there might not be much of a market for his pending UFAs. The Wings GM has reportedly set a first-round pick as his asking price for Howard and Nyquist, which could scare off potential suitors. Given the lack of goaltending depth in the Wings system, I expect Howard will be re-signed. Jensen could also be retained. As for Nyquist, that seems less of a certainty. It’ll depend upon how much of a raise he’s seeking. THE ATHLETIC (subscription required): Sean Shapiro recently noted Dallas Stars GM Jim Nill last week admitted in an interview he’d like to add scorers. With defenseman Marc Methot on long-term injured reserve for the rest of the season, they’ll have over $2.4 million in salary-cap relief to invest in some secondary scoring. They could also free up more room if sidelined Stars Martin Hanzal, Stephen Johns, and Tyler Pitlick end up on LTIR for the rest of the regular season. While acknowledging the noteworthy talent potentially available in the trade market (Panarin, Ottawa’s Mark Stone, Philadelphia’s Wayne Simmonds), Shapiro suggested Detroit’s Gustav Nyquist and Anaheim’s Jakub Silfverberg as realistic rental options. Players who could benefit from a change of scenery include the NY Islanders’ Joshua Ho-Sang and Washington’s Andre Burakovsky. SPECTOR’S NOTE: Nyquist and Silfverberg might be more realistic options but there’s no certainty they’ll be available. The Wings would like to re-sign Nyquist while the Ducks are in talks with Silfverberg, who’s expressed his desire to stay in Anaheim. Jesse Granger examined the needs of the Vegas Golden Knights and their possible trade targets. He believes they need third-line production and suggested Philadelphia’s Wayne Simmonds, the NY Rangers’ Mats Zuccarello, Vancouver’s Nikolay Goldobin and Ottawa’s Mark Stone or Ryan Dzingel. SPECTOR’S NOTE: All but Stone, who’s a top-line right wing, would fit well on the Golden Knights’ third line. Given Vegas GM George McPhee’s deadline trade history, I expect he’ll swing a deal before Feb. 25. LOS ANGELE TIMES: Curtis Zupke reports Kings GM Rob Blake was sarcastic of a TSN report suggesting his club will likely make their biggest moves in the offseason than before the trade deadline. “TSN, they’re running our team, then I guess they understand that,” Blake said. “There’s speculation every day on this and that. I’m not going to get into that.” He said he’s looking for deals similar to the Jake Muzzin trade, moving a veteran player for draft picks and prospects. I swear some reporters just make stuff up to have a story to print. GM’s almost always refute anything Dreger or Friedman ever report. And yes, they are rumors, but c’mon man! As a Sen fan people said the very same thing when Karlsson was first rumoured to be likely traded. It took almost a year but proved to be true. Friedman and Dreger along with others on TSN and Sportsnet base their opinion’s on what might happen from information they know to be true. Take this summers Senator mess. They both (dreger and Friedman) have claimed Dzingle likely the odd man out as Ottawa focus’s on Duchene and Stone. Seems a reasonable opinion but at no point did they claim it as a certainty or even rumoured to a deal in the making. Now it seems their opinion is that Duchene and Stone may both be traded. Makes sense, Ottawa has a history with not offering as lucrative contracts as other teams around the league. We have a possible up coming lockout/strike with the CBA negotiations to come. Players want money protected so it isn’t clawed back the same way it has in the past. Hence all the crazy signing bonus’s going around. Toronto example of the Tavares, Nylander and Matthew contracts are prime example. So yeah they’re not making stuff up by reading tea leaves or something. There credibility has long been proven. I suspect Bettman will make steps to stop these bonus filled contracts during the next negotiations but he also said he isn’t looking for a fight so we shall see. It is apparently obvious that though the fall under the rules of this cap system they go counter to the idea of the league parity the new cap system was put in place to create. This conjecture of mine is not rumour nor will it be if Friedman says the same thing. I’m curious if the Kings would consider a trade for Quick, and go forward with their two young goalies? What would the asking price include? Heard anything? I’m not nearly as informed as Lyle is,obviously, but alot of people who Wright about the Kings are saying they love where Campbell’s and Petersen’s game is at. The same writers are saying Quick will likely be traded by the draft and that they’d love to get a 2020 first rounder and possibly a second asset in exchange for Quick. Lyle are you hearing similar things regarding LA and Quick? There is talk the Kings could move Quick and stick with their younger goalies. The expectation is they’ll wait until the offseason to move him. Time will tell if that comes to pass. Earlier this season, Quick was linked to the Flyers but Carter Hart’s impressive debut has largely silenced that chatter. Saying that Lyle is “informed” is the overstatement of the year. He simply regurgitates gibberish that lacks validity and substance. I have yet to visit this site and come away more informed. Just my opinion. By the way, the Flyers just traded Dale Weiss and Christian Folin. Lyle was all over that one. Glad you enjoy the site, Lou. Obviously, you’re a regular visitor or you wouldn’t have taken the time to read the comments. Appreciate your support regardless of your opinion of this site. Cheers! You have a talent Lyle for taking even the runniest steamiest stinkiest pile of poo and turning it into a quality opportunity for class. What was the link to your page again Lou? Yeah you should probably shut up then. “It’s one life, one chance for free agency and I want to test free agency,” said Panarin. Any GM trading for him must realize he is a rental only. Panarin wants to control the narrative, drive up his price and take the best offer with the best opportunity to win. Don Sweeney please stay away. Offseason have at it. I get the feeling that Kekalainen rubs Panarin the wrong way with his arrogance and Panarin and Bobrovsky want to rub it in his face by not accepting a trade then bolting in the off season. Hey Matt, just so you know, according to Lebrun, there were multiple teams that went hard after Kovalchuck in the offseason. The delusional narrative that the only reason LA landed him was the fact they were the only ones offering a 3rd year is plain wrong. LA landed him over about a half dozen other teams is because Kovalchuck chose them, end of story. So apparently there is 6 other GMs that shouldn’t be running a team. I don’t know about that King. It was reported that the Kings were one of teams willing to go three years. Some teams were not willing to go to 3 years. It was also reported that Kovalchuck prefer destination was LA. In the end the 3rd year was what Ilya wanted and received. Yes I believe other teams would’ve taken the risk and some still might. We’ll know by trade deadline. Show me the report that says LA was the only team willing to give 3 years and I’ll admit I’m wrong! But I can show you the report from Lebrun that says multiple teams were going hard after Ilya but his preference was to play in LA. Says nothing about the 3rd year. Wether or not he is moved by the deadline means nothing on if other teams were willing to give that 3rd year, it’s completely moot. Canadian King, show me the report. Also about being traded is just an add on to your discussion. I can show you a tweet from Lebrum stating Don Sweeney saying a three year deal wasn’t idea for Boston he prefer a two year deal. That’s not saying another team didn’t. If Boston offered a 3yr deal I still think he signs in LA regardless. Marleau needs to go ASAP. But, realistically his contract is unmovable, thus we have to ride it out. Mike you’re not getting Panarin under $9m per season. Back to the drawing board. Not getting Kapanen for 3 mil a season either. If the cost of Kadri and Brown, a 2C and relentless winger with some skill, is only a slow D-man and a 1st, I am in. Kevin Miller and 1st. Will even thrown in Bjork or Donato. Sorry RayBark,. I only want McAvoy or Marchand or Bergeron from your team. If you can give me anyone of those three you can have Kadri Brown plus picks. If not TO only need GUDAS and Flyer’s 1st. Kadri will benefit the Flyers as Gudas will be for the Leafs. We dont have room for 4.5 million dollar player at 3rd line after signing Panarin for 9-10mill. Any predictions on the playoffs, Mike? Maybe the weather? Politics? Cost of gas? BCLeafFan. Warmer weather in the horizon. Trump will usher in WW3 in his last year of presidency. That’s inevitable. Gas price will rise again in coming months so enjoy the decent gas price now. This year playoffs Tampa will win their 2nd Stanley Cup against San Jose. For my beloved Leafs they will fall short against Tampa in 6 games. For bonus advice pay off your MORTGAGE asap as the interest rates will rise by several points in coming years. Thanks, Mike. Good predictions except for the hockey stuff. Tavares 11 per, Mathews 11.6, Nylander 6.96, Marleau 6.25, And you’re suggesting 9.28 for Panarin? Where is the money for Marner coming from? Not to mention the rest of the UFAs and RFA’s they need to re-sign or replace? I doubt Carolina has interest in Zaitev, and Nylander as a package. How are you going to afford Marner’s 11 mill plus contract in that too? What would make that trade work besides a 1st rd pick. Would they give Sanheim & a 1st for Quick and Tiffoli? They do have Ghost & Provorov already…can they risk giving him up? LA does not need to clear cap space. With their current roster they’ll have 10 mil open next year and have to re-sign Iaffalo, Kempe, Peterson and a few others. Nothing major. Cap space is a non issue for the Kings. They’ll trade Quick, Carter, Martinez, etc if they get the return they want (Muzzin trade)-not to clear space. I would like to see the Flames acquire Stone from Ottawa. The flames could send their 1sr round pick, Dillon Dube and for cap reasons Frolik would have to be in there as well. Frolik seems like a throw in but as I have said many times he is a very good player. The only problem if that were to happen I cannot figure how the Flames would be able to sign Tkachuk and Stone and get under the cap of 83 million. Others have speculated Tkachuk would want 7.5 million, I suspect Stone would want 8 million, so that would send the Flames over the ceiling. Maybe Tkachuk signs a lesser deal of say 5 million but I doubt it. If the Flames did acquire Stone, I think that could put us over the top. Stone may want up to 9 million. I was thunking Anderson may be a good pick up for the flames to shore up their net for the playoffs. Dependent on the cost. Quick would be a nice fit in Calgary. A young Kylington and a first 2020 and a prospect. LA would need to kick in something else to balance the deal. Send Rittich down and not resign Smith next year. Screw Panarin and Bob. Who by the way has been brutal in his entire playoff career. Don’t think they move as a set . Got to love Russians. How many on the top 5 teams ? One on the Bolts and none on the Flames. I do like Quick as well, I would not send Kylington. He is young and his upside is to high especially going into the playoffs the Flames will need the depth on defense. Quick and big save Dave Rittick would be a strong goaltending tandem. I will step out on a purely fantasy limb her and combine my trade scenario and yours. FlameFan, I love the idea of nabbing Mark Stone, and the cost that you mentioned would be worth it if the Flames could re-sign him. I really don’t like the idea of giving away (what?!) a second consecutive first rounder plus a potential 1B, 2A defenceman for an aging, injury prone goalie whose value may only last a few games. Completely nix that trade. Quick would be well worth it as a 1B to Rittich, but not for such a steep cost. At this point in his career, he would fetch a similar return to the one that Tampa got when they traded Ben Bishop to the Kings in 2017. Quick to Calgary for Spencer Foo, a 3rd round pick and a conditional pick of some sort. I agree, I was only using those players in response to Silverseven,s trade suggestion for Quick. With Dorian about Stone. If anyone can make the Stone deal it would be him. Stone would be an unbelievable addition for the playoffs. He is a big body that can get into the dirty areas win puck battles and he scores. If the Flames did get him I am sure they would do it with a plan to sign him long term. Florida may find a way to get them both. I get the sense all Panarin wants is to live in a city he considers conducive to his life style desires more than his chances to win a cup. LA as my peime landing pads for panarin. The last two a bit of a stretch. Ken Holland simply does not understand what needs to be done. Is he purposefully trying to screw the Wings before he’s run out of town? Seriously, does anyone agree that resigning Nyquist and Howie is a good idea without trading them for something first? Re-signing Howard makes some sense since he’s close to retirement and there’s no good solution in net in the system right now. Howard gives them some time to figure that out by the time the Wings are playoff worth again. Re-signing Nyquist makes absolutely no sense whatsoever.